A few months ago, the board and myself decided it was time to get me some real part time help in our office. After having amazing interns to help me over the years, we knew it was time to hire an individual to help in the USA office. I was so excited about this opportunity, but also a bit hesitant. Who could I find that could love Arise Africa and be committed to what it takes to work for us? How could I ever find someone who is organized and can put up with me everyday in the office AND deal with my very short attention span?! Who would run behind me cleaning up my messes and keep me in line!? (that takes a very special person who has lots of patience) Who would be ok with my 90 pound chocolate lab in our office everyday and love her as much as I do? And who could even ever consider putting up with the rest of the crazy people in our office building?! Well God took care of that. A few weeks ago I was at a friend's wedding and ran into Anna, who was on one of our mission trips years ago. Anna has spent the last few years working for a wedding planing company in Dallas and was actually the planner at my friends wedding. I randomly asked her how things are going, and she mentioned she was interested in doing non-profit work. And that's when I attacked her like a vulture! I mean I almost knocked over the wedding cake to talk to Anna. It wasn't too graceful, but I didn't care. "Woah, woah, woah what do you mean Anna?!" I asked. She seemed a little startled, probably because I looked like a linebacker trying to tackle her in my excitement at this possibility. After a few minutes of discussing I knew I had to try to get her! I left the wedding with a full plan on how to recruit. First, I called/possibly harassed the Kershaws, because Anna is actually Ellen Kershaw's friend. I thought that between Arise Africa and Kershaw's Challenge we could share Anna and pay her full time. I left text messages saying things like "Guys, she will save both of our lives. We have to act now because she'll be snatched up fast." In the end the Kershaws agreed and we got to hire Anna!! It's been a few weeks since Anna first came to the Arise Africa office. I knew she would fit in well when she didn't miss a beat when the office neighbor's 20 pound cat came into our office - she didn't flench. (Tiger, he has a thyroid problem). She takes notes on everything that happens in meetings and then reminds me of what I said I would do!! What? That is awesome! It's like having Siri run around with you all day reminding you what is coming up. (Anna's voice is not annoying like Siri and she actually pronounces things correctly and doesn't give you directions to places that don't exist). She has picked up so fast on donor database programs and is working hard with our Zambian staff to get spreadsheets up to date. Anna will wear many hats with Arise Africa. But most importantly she is my right hand person. Let's be honest, in about a month Anna will be telling me where to go, what to do, who to email back, and what meetings I have coming up. And I can't wait! WHERE HAVE YOU BEEN ALL MY LIFE, ANNA?! 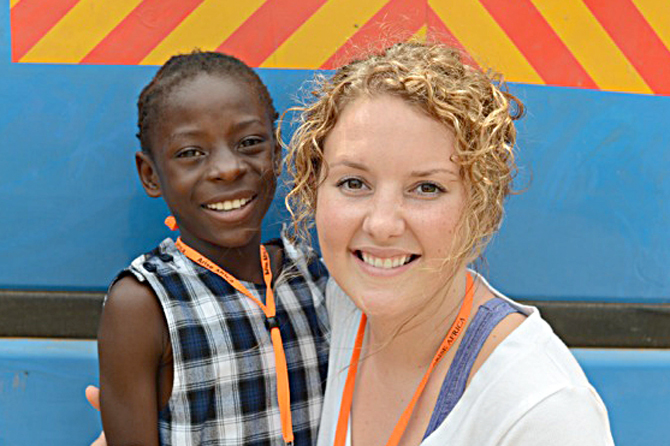 Anna also is in charge of our child sponsorship program in the United States. This requires constant work and attention to detail. The burden of that being lifted off my shoulders is great. I can now focus on bigger picture items and know that very important program is taken care of. We are so excited to welcome Anna to the team! Now, let's pray I don't scare her off!